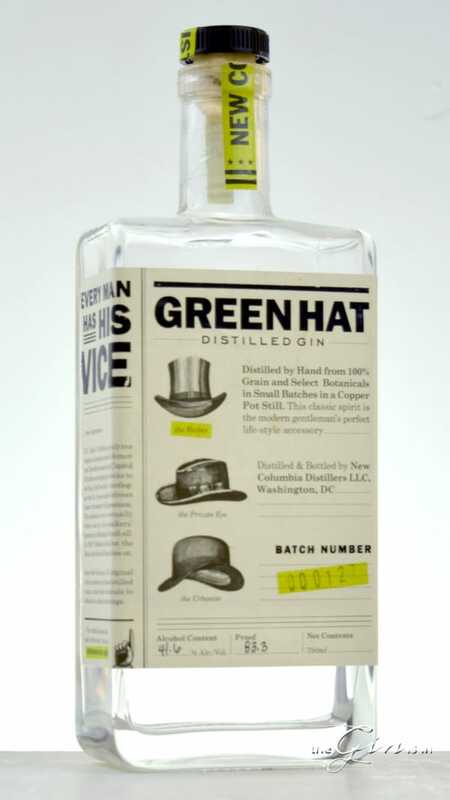 Green Hat Gin is a grain-to-glass gin distilled at New Columbia Distillers’ distillery in the outskirts of Washington D.C.
Beginning from a base spirit distilled from soft winter wheat in a traditional copper pot still. Botanicals are imparted through vapor infusion. New Columbia Distillers suspend the botanicals in a basket, and is also chill filtered. And if all you wanted to know about was the “green hat,” the Green Hat Gin website has the story. The TL;DR is, that the very people who made the U.S. prohibition laws were staying anything but dry— buying gin from a man in a Green Hat throughout the 1920’s. In 2013, we originally reviewed batch 5; the revision was done tasting Green Hat Gin batch 127. Illustrious citrus and light floral notes on the nose— orange, lime and citron zest— Green Hat Gin has a pleasant dose of pine, fennel seed and coriander. Bright invocations of linalool. The nose is as pleasant and balanced as it is distinctive. The palate is zippy with a bit more spice. Citrus cast a wide net. There’s a taste of sweet ruby red grapefruit, dashed with pepper and cassia. It’s finish becomes a bit more of a melange with menthol-kissed notes of sage and rosemary— juniper is part of this accord as well— along with notes of celery and zesty pepper on the tail. Green Hat Gin’s finish is moderate in length, with a cooling warmth. It’s hard to pick out specific notes here as like a good perfume, the botanicals combine into something bigger and more cohesive. Really lovely stuff. As for contemporary style gin in cocktails, I find Green Hat to be one of the most versatile. I love it in a Martini— wet or dry. It’s great in a Gin and Tonic and makes a nicely balanced Negroni as well. Green Hat Gin is one of those gins that can be a top shelf workhorse in your bar program. I love the way the oily citrus brings life to citrus cocktails like The Gimlet and Tom Collins. Or even further into the bag of tricks with something like a Bronx Cocktail. It’s as at home with floral counterpoints as well— Aresenic and Old Lace and the Clover Club warrant mentions— but the point here is that Green Hat Gin is versatile. Highly recommended in both its category and overall. “almost jammy sweetness.” I’d take off the word almost, and you have a great description of this gin. The botanicals from which it was distilled would primarily seem to be Rose’s lime juice. You say the juniper is somewhat in the background? I say, where’s the juniper? I really, really wanted to like this gin and had heard good stuff about it from people whose taste I trust, but this gin has a nauseating taste of butterscotch to me. Not great unless you mix with other strong flavors, and made one of the worst martinis I’ve ever mixed in my home. Hey, I’m sorry to hear that. I think it’s a great example of contemporary style gin, but I can understand that it’s not really for everyone. Hope you’re able to find another gin that you do like. What kind of gins are you drinking these days? I will second Donny on the disturbing note of butterscotch, and add that further tasting gives me a note of oiliness. It suggests to me that they have not mastered their potstill. The bottle was a gift, hand-carried from DC to the west coast, and so it’s embarrassing to say “yuck”. I found this page while looking for reviews, in order to see if Green Hat were aiming at an Old Tom style, something quite out of my experience. It doesn’t seem so; maybe the quality varies from batch to batch? I’d say Nolet’s is far and away my favorite these days. I’d rate 209, Junipero, and Tanq 10 and a whole lot more ahead of the Green Hat. Have to say I was a little put off when I had it straight after being shaken. Did like the bouquet, but the taste was a bit disjointed and unbalanced, like it didn’t know what it wanted to be. There was some appealing citrus mixed in with a pronounced salty flavor. However, other than the salt, it lacked the oomph necessary to have real character. The opinion that it could use a higher proof is spot on. I’m not a neophyte gin drinker. I enjoy many different styles of gin including Martin Miller’s Westbourne Strength, St. George’s Dry Rye, Hendricks and Berkshire Mountains Ethereal Batches. I’m sure that the comments on Green Hat being a great partner in a G&T are true. It probably will go well in a gimlet and mixed with ginger beer also. One review I read of Green Hat said it was in the style of Hendicks and Dorothy Parker, but I think that reviewer must have had some distorted taste buds. In any case, I’ll try it again straight and in various mixed combinations. Maybe, I’ll have a different opinion then. I’m in the D.C. area and wanted to support a local craft product, but . . meh. Green Hat has got an off-balanced funky thing going on that I just could not warm up to. I worked my way through a 750ml over the summer but never grew comfortable with the taste despite repeated tries. Right now, it’s Uncle Val’s, Green Hat and Nolets. But there’s always more to be explored.